You can't fault Iomega's new ScreenPlay TV Link Director Edition media streamer for versatility. It can handle pretty much any video format you can throw at it, including MPEG 1, 2 and 4, WMV, AVI and FLV. It's DivX-certified, and unlike last year's ScreenPlay Pro HD, it supports the H.264 standard as used by the iPod. 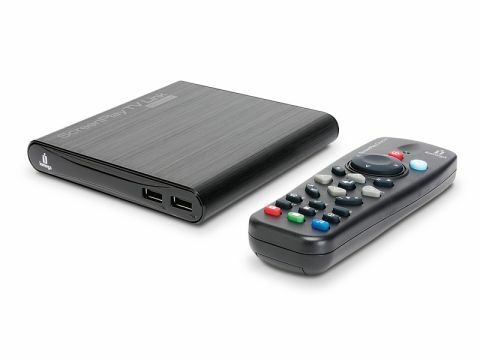 It can handle HD video up to 1080p, and supports a wide range of audio and image formats too. It also lets you access online media such as Youtube, Flickr and SHOUTcast internet radio, and even run torrent downloads. Unlike Iomega's ScreenPlay Director HD, the TV Link model doesn't have an internal hard drive. Instead you can connect a USB flash or hard drive to one of the device's three USB ports, or stream media over your local network (UPnP and DLNA are supported). Streaming is through Ethernet or Wi-Fi, which requires a separate adaptor. Unfortunately, it has to be Iomega's own ScreenPlay Director 802.11n. ScreenPlay TV Link streamed our videos with ease. The interface is intuitive and easy to navigate, but lacks panache and flexibility. It doesn't display album art as you pick through your tunes, and list options are limited to alphabetical order. It can be slow to respond to your inputs too. One day, someone will release a media streamer with the finesse of Apple TV and the versatility of Iomega's ScreenPlay TV Link or Western Digital's WDTV. Until then, this is as good as any.